On 1st May 1730 William Pulteney3 signed articles of agreement with Thomas Phillips of St. George’s, carpenter, and John Mist of St. Anne’s, paviour. The terms of this agreement are not known, but most of the building leases subsequently granted by Pulteney to individual craftsmen for the erection of houses in Sackville Street were granted at the direction of Phillips and Mist, and it is therefore probable that they acted as principal contractors and supervised the joint work of the individual building tradesmen. Between 24th December 1730 and 8th June 1732 Pulteney granted thirty-eight building leases. On 31st July 1734 he granted one more, and on 20th March 1741/2 another nine, these last being for the seven plots facing Piccadilly and for the two easternmost plots in Glasshouse Street. All the leases were to expire at midsummer 1791, and nearly all of them were granted to individual tradesmen, the largest number (thirteen) being taken by Benjamin Timbrell, carpenter, of St. George’s, Hanover Square. Timbrell’s status is not clear, but as he was a party to several leases granted to other craftsmen, it is possible that he was in these instances employed directly by Pulteney. Most of the new houses were ready for occupation by 1733. Only Nos. 29 and 36 seem to have been finished expressly for the persons who later occupied them. In the case of No 29 this was to William East, barrister. Sackville Street must have been very attractive when first built, its width of about 42 feet being generously proportioned to the houses, mostly of three storeys, with fairly uniform fronts of simple design, built of good stock brick with stone dressings sufficient to avoid an appearance of monotony. Something of this charm survived until the end of 1961 in the northern half of the street, although many of the houses had been altered and most had been heightened by an added attic storey. Though perhaps not in the first rank of fashion, the larger houses in Sackville Street, particularly those on the west side, attracted throughout the eighteenth century the minor nobility, the dowager, the member of Parliament, the senior army officer and the prosperous medical man. But the present commercial character of the street is not of recent origin. Even at the time of building there were three shops (two apothecaries’ and a cheesemonger’s), one tavern and a coffee house. By the beginning of the nineteenth century the tailoring trade, which is so prominent in the street today, had already established itself. Out of thirty-two tradesmen and professional men listed in Sackville Street in the Post Office directory for 1830 about 40 per cent (thirteen) were tailors; the next largest group consisted of four solicitors. This proportion had not changed considerably by the early 1960s, for although many of the houses had been divided and there were fewer private occupants, about 34 per cent of the one hundred and fifteen listed tradesmen and professional men were tailors. 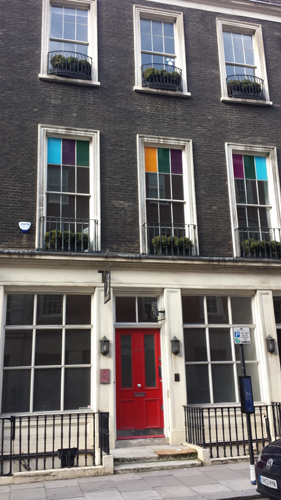 No 29 Sackville Street is a terrace house of ca.1731 with some early to mid nineteenth century alterations. It is of brown brick, with a slate roof and of three storeys with a basement and dormered mansard. The house is three windows (31 feet) wide and has an architraved doorway to the right with cornice on consoles. There is a moulded cornice over the second floor; parapet with coping. There are wrought iron balconettes to the windows and area railings. 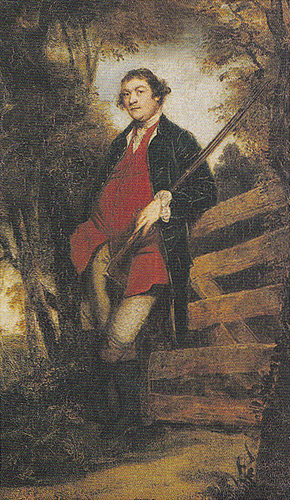 John Parker, 1st Baron Boringdon (1734/5-1788), by Sir Joshua Reynolds. I was asked to examine the Adam ceiling to see how much of the original had survived the fire. 1Soane Museum. 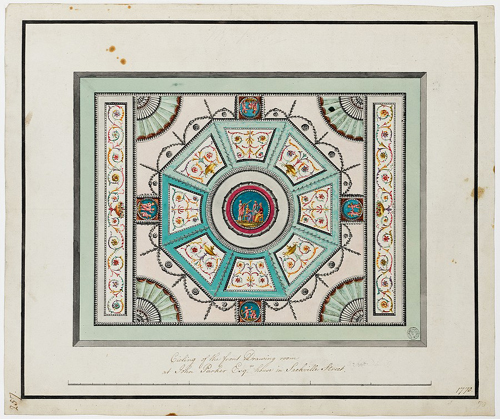 Preliminary drawing and alternative finished drawings for a ceiling for the drawing room, 1770. This drawing as executed (Adam volume 11/257). NB I have copied the 18th century spelling of ‘ceiling’. 2This has been taken directly from the sources below. 3Later 1st Earl of Bath. 4The details of which can be seen here. 5Henry Barry, 8th Earl of Barrymore (1770-1823) was one of Prinny’s Set, a group of wealthy young men who were associated with the Prince Regent (the future George IV). His elder brother, Richard Barry the 7th Earl of Barrymore (1769-1793) bore the nickname of Hellgate for his wild behaviour. On his brother’s death Henry was dubbed Cripplegate since he limped, probably due to a club foot. 1) F. H. W. Sheppard (General Editor) ‘Sackville Street’, Survey of London: volumes 31 and 32: St James Westminster, Part 2 (1963), pp. 342-366. 2) See also English Heritage Listing. hi Mr Baty I painted a Robert Adam ceiling in Sackville Street. I think it was the late 80s. I was wondering if it was the one your referring to here at 29? It was the most satisfying job I ever done after laying on my back for hours and applying so many colours, after seeing the beautiful end result it was worth it. Just thought I would let you know that little bit of information after seeing your article. Many thanks James. I suspect that you worked on another of the fine ceilings in the Street. This had been replaced in the 1960s after a fire and only layers of white could be found.